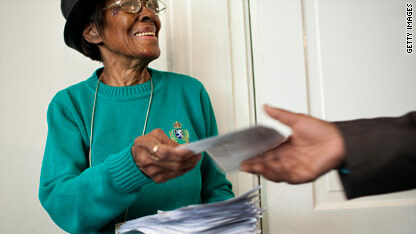 Ruth Williams passes out bulletins at the Third Ward in Washington, D.C., a diverse Mormon church. Washington (CNN) - The scene at a Mormon congregation here on a recent Sunday would surprise Americans who think of Mormons as young white missionaries in stiff white shirts, black ties and name tags. On this Sunday, the Sacrament - what Mormons call the remembrance of the Last Supper and what other Christians call Communion - is said in French, a nod to the area's burgeoning West African population. It is not a special multicultural celebration Sunday. For this growing Mormon congregation in northeast Washington, it's just another weekend. “It’s 30% Caucasian, 30% African-American, and the rest is a combination of first-generation immigrants from around the world,” says Bishop Robert Nelson, the lay leader of this congregation. 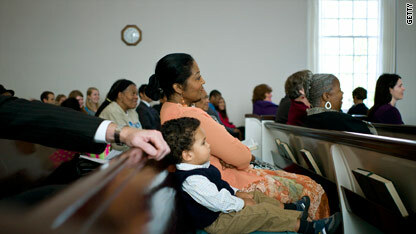 A diverse group of congregants from the Third Ward listens to a sermon. Washington's Third Ward is a near mirror image of the diverse neighborhood it serves, jarring with the Mormon Church's image as a faith-based club for upper-class whites. Explain it to me: What's Mormonism? And the Mormon Church, officially called the Church of Jesus Christ of Latter-day Saints, says the ward represents the diverse face of modern Mormonism, a message it has been trying to spread as part of a yearlong nationwide push to counter its lily-white image. Since January, the LDS Church has spent millions on an "I'm a Mormon" advertising campaign that features television commercials, billboards and bus signs with Mormons from African-American, Asian, Latino and other ethnic backgrounds. Just last month, the campaign entered 11 new major media markets in Texas, Indiana, Nebraska, Washington, Georgia and Arizona, hitting cities like Atlanta, Denver and Phoenix. The Mormon Church even used the ad campaign to launch a shot across the bow of the hit Broadway musical "The Book of Mormon," buying a digital "I'm a Mormon" billboard just down the street from the theater where the show is playing. The musical satire, co-produced by the creators of the television show "South Park," shows earnest white American Mormon missionaries and their misadventures in proselytization in Africa. But the billboard shows a very different face of Mormons. There is an African-American couple playing Frisbee on the beach, a Latino grandfather and granddaughter, a goateed motorcycle sculptor. An official church website, Mormon.org, lets those interested in the church search for Mormons from diverse ethnic backgrounds and features videos from the likes of black soul singer Gladys Knight and Brandon Flowers, frontman for the rock band The Killers. "It's to say, 'We're like you,' " said Kathleen Flake, a religious scholar from Vanderbilt Divinity School. "It's an attempt to combat stereotypes so that absolutely people are more open to see the normalcy of Mormonism." The LDS Church says its attempt at an image makeover is as much a reflection of demographic reality as it is a PR effort. While young white missionaries may still be Mormonism's public face in the United States, they are no longer fully representative of the Salt Lake City-based church. As head of global missions, Allen supervises the 52,000 19- to 25-year-old missionaries knocking on doors around the world. He's also executive director of the “I’m a Mormon” campaign, which began in nine markets this year. As the church’s efforts to win converts has expanded internationally, “following the American flag around the world,” as Flake puts it, the LDS Church has grown more diverse. The church's membership has doubled since 1988, to 14.1 million Mormons worldwide. Six million Mormons live in the United States. Many of the church's members live in the American West and Northwest, in some of the whitest states in the country. But like many other churches, there has been explosive growth in the LDS Church in Latin America. There are more than a million Mormons in both Mexico and Brazil. There are nearly a million Mormons in Asia and 300,000 in Africa, according to church statistics. “This attempt to emphasize diversity and to emphasize a wide range of people who are Mormon does reflect, in a lot of ways, what’s been going on in reality for a while,” says Matthew Bowman, an editor at a Mormon studies journal called Dialogue. Even in the United States, the perception of who Mormons are has changed. While that's less the case today, Allen says many people still don't know what a Mormon looks like - or don't know that there are Mormons from minority backgrounds. A spokesman for the church said it doesn't keep statistics on members' race or ethnicity. There is no church shopping. Congregants can’t go to another ward if they don’t like the music or the doughnuts at the social hour, as in many other faith traditions. In Washington's Third Ward, two new converts who had recently been baptized were welcomed into the church on a recent Sunday. Both women were young African-Americans. The men who formed a circle around them and prayed over them were all white. Unlike the ward, the church's global leadership in Salt Lake City is mostly white. It was not until 1978 that African-Americans could serve in priesthood positions in the church, a prohibition that extended back to Mormon leader Brigham Young in the 1850s. "When you see in that ad campaign Mormons, including African-Americans, they are trying to communicate against that stereotype that Mormons are racist, there's no question about this," says Vanderbilt's Flake. "They are trying to say, 'That's not fair. That is not who we are. Even if we were, we are not now.' "
Allen says the "I'm a Mormon" campaign was designed to assist the small army of young Mormon missionaries out knocking on doors. ....so I guess that it is an issue, just not a "significant" one. From whose perception? Can black men or women enter the "most holy" part of your temple? Just a question. All worthy members are allowed into the Temple. Black, White, Asian, Indian and so on. Absolutely all worthy members can enter the temple regardless of race or nationality. There are currently 3 temples in Africa as an example: one in Ghana, one in Nigeria and one in South Africa. A fourth has been announced to be built in the Democratic Republic of Congo. There are temples throughout the world and more are being built to provide the blessings of the temple to members of the church in all nations. Temple worship is performed in the language of the people where the temple is built. When there are many languages in the area, worship is scheduled for different languages at different times to ensure all can hear the world of the Lord in their own language. I was in the temple in Dallas last night, performing ordenances with the youth of our LDS ward. I laid my hands on the heads of white, asian, black and hispanic young people. All were edified. Just a comment as I browsed through. The whole thing about advice not to marry between races which were once said as reffered to, has to be seen in context with statements before and after, it was never any advice in scripture other than to marry with the faith (not to confuse doctrines and to keep priesthood in line of family), obviously you do not need to think a lot to see the advantages of this, to avoid too much conflicts. It does not mean you cannot marry any race you wish, as today races are much less likely to be related to fath as before. Today many many marry with cultural differences, and so did I. I also married to a person of different faith. Needless to say there are big differences to overcome, and it takes two to overcxome them even today. So when this is an advice it is just because of the possible consequences and it does not apply to all persons, some can handle differences better than other, cultural and even faith differences, but at some levels there may be impossible confrontations that most will have to give up on, for example todays practices among some faiths (and not LDS main church) to marry more than one wife and to take on their cousin if the husband dies. I think some cannot differences be bridged. There are only those advices and all the rest is just either personal opinion of anybody even leaders and not scripture, or general advice. I can advice much from experience too, but it does not make it obligatory or scriptural for anybody to follow. However if most married to diferent culturures it would be good as long as they keep their faith to avoid unncecessay strain on marriage relationships, inte3rfaith marriages are nonetheless a very different cup of tea over time, and if overpractices (which is unthinkable) would lead to a lack of followers and thereby in our church priesthood holders to move th echurch admin along over time. Hardly very likely to be the case in our time, with so many millions but for some it would also present an economic probnlem to be global with grandparents in Indonesia and one in US and another in NIgeria, etc, it is just a practical advice also. DONNA, Texas — Two LDS missionaries were killed while riding their bikes in this southeast Texas town Tuesday and a third was critically injured in the same apparent hit-and-run accident. Pidamos al Senor para estas familias, que el comfortador este' con ellos en estas horas dificiles. Y a la vez por nuestros y lo hayan hecho. Seems like a lot of people that don't believe in God or religion spend more time worrying about it than those of us that do. Particularily – Reality. its called intelligence. the ability to discuss what you see as incorrect. if you said their was no gravity i would argue their is as as it's affect can be seen altho not visible. same thing? You have a point there, no question. I think it depends on the person. I've seen very religious people who do worry about their faith, and some who don't worry about it at all. I've seen very unreligious people who are content with being unrelgious, and also those who make a big noise about faith and worship and all the rest. Maybe religious people sometimes worry more about religion simply because they have a religion they think is worth worrying about. The church might be waging a (semi) successfull campaign against the perception it is racist. Given that I grew up in the church, and most of the folks I met in the church were pretty racist, you'd have a hard time convincing me. What the church will never, ever, be able to shake is the anthropological DNA evidence, evolutionary linguistics research, and the archaeological evidence that demonstrate clearly that the Book of Mormon is made from whole cloth. Native Americans are NOT descended from people from North Africa or the Mediterranean. Native American languages did not evolve from Aramaic, Hebrew, or anything else from that region. No one has found any archaeological evidence that Native Americans in North America had contact with mediterranean cultures, and particularly in upstate New York. There isn't a shred of reliable, accepted scientific evidence to support the claims in the book of Mormon, but there is plenty that says it is an impossibility. At least with traditional Christianity / Judaism, you have things like the Dead Sea scrolls, Roman records, a history of the gospels dating back to 400 AD or a little earlier. Mormonism? Nothing says its history existed before the 1830's. How is the church going to beat that one back? It won't, as long as Americans have a shred of scientific literacy. Isn't that the beauty of the message though? If you were given hard evidence for everything, then there would be no faith. If there was no faith, then we would all aimlessly follow because the hard facts tell us that's the right thing to do. And by the way, who says that the hard facts are in fact correct? How many hypotheses that stood for YEARS as the cornerstone of knowledge have been rebuked and overturned due to new facts? Don't you want to act because of an underlying conviction you have rather than hard, statistical data? So what if opponents of the LDS church don't support some of the claims of some of the members. The 14.1 million members worldwide don't look at that anthropological evidence, they look at the spiritual convictions each has experienced that strengthen their faith in those beliefs. You would believe in silly things SIMPLY for the sake of believing, in SPITE of evidence to the contrary. I could never be such a Fool, I respect my intellectual integrity too much to do that to myself or associate with those that do. Since you believe in things just for the sake of believing, don't you understand that it does not matter one wit WHAT you believe in? @Brent Slensker: It doesn't matter what I believe in? Do you really believe that? If I didn't believe in abiding by the law, then where does that leave society? But I do believe that following the law is important, and as such, act accordingly. And my belief in my religious views is more than simple belief, which I pointed out in my original post.You need to look at the difference between belief and conviction, as there is a huge difference. As far as respecting your intellectual integrity too much to associate with those that believe in something that you obviously don't, that just shows how narrow-minded you are. It's a wonder if you have anyone to associate with at all. I have read through all of the comments posted here. First, the article was fantastic and very much appreciated. Also, I appreciated all the comments given here and the good interchange of knowledge, views and beliefs. I do want to point out that judging an entire church based on one or two quotes taken out of context would basically eliminate every church in existence. My grandmother decided religion was all hypocrisy at a young age and never would join any church because she met the Reverend Billy Graham when he was younger and he laughed at an off-color joke in her presence. That in no way goes to show that Billy Graham is not an amazing individual (he converted Nelson Mandela! ); but it goes to show that he can make mistakes, as can all men and women, even religious ones, and it does not make them or their church horrid. It just means everyone is learning - even people in high positions! Also, there is a general legal standard of a preponderance of evidence that must be applied in reasoning such questions, and one or two quotes taken out of context does not prove a pattern against interracial marriage in the Church of Jesus Christ of Latter-Day Saints. Look hard and there will be next to no other "Evidence," certainly nothing showing a pattern of teaching against interracial marriage - rather a pattern attending to the needs of families to be happy and stay together and care for their kids and love God, etc., all the things a family should be doing who want to worship the Lord Jesus Christ. Their online materials are open for reading and pretty clear. Also, Protestantism and so-called "mainstream" Christianity have a varied view and history - not exactly clean! - on interracial marriage, and the question of race at all. Let us not forget that many KKK members were Protestant "Bible Club" goers. Can't we all give each other a break here? History is evolving and people are changing and becoming more accepting of one another, and we do not need to judge one another harshly, and it pays to look at the preponderance of evidence rather than a few select quotes. It seems that JustWondering wants to see only his own view regardless of the reasonable information given to him by a member of the actual church. And shouldn't someone in the actual church know what they teach and believe? Think about it. About 30% of the Mormon church actively participates in the church world-wide. Many of the 70% that does not participate because what they learned after learning the basic Good News of the church left them wanting. There are many former Mormons (including myself) that know the extent of the racial inequities in the church far-exceeded two random quotes. The problem the church has with its racist past is that it teaches that its leaders speak for God. Have a separate caste system for blacks for 148 years would lead a normal, thinking person to believe this policy started with a racist man, which it did (Brigham Young) and continued until someone (Spencer Kimball) had the courage to do something about it. It is no surprise that the civil rights movement and the unwelcome negative press that BYU was receiving gave him that courage. who really cares about religion in the arbitrary point known as the 21st century only those afraid of death,it's going to happen get over it, it's called mental health. If god existed would it hide or only talk to one person in a strange place and time quit being dorks there is no god. I stand before the foolish thing and it will not take action against me because it's impudent. A challenge forever unmet. Some good points slayer, but most Mormons are not afraid of death at all. Life is eternal, we die and resurrect just like the Jesus Christ that we study and follow. Because of this, the Mormon faith, The Church of Jesus Christ of Latter-day Saints believes that all of God's children, all of us, past, present and future will hear of Jesus' sacrifice for us and can choose to accept and follow him if not during this life, after they have passed on to the next. Those in Africa, China, or distant islands even those born before Christ will hear of his work and accept his teachings after death....no one is judged by Jesus Christ in ignorance, we all get an opportunity to become Christian. A well-written article on Latter-day Saints. As a Latter-day Saint, I appreciate that. Using “can’t” in this sentence misses the mark. “Ward hopping,” as we call it, is actively discouraged, but no one who peacefully attends a ward’s meetings will ever be barred from attending simply because that person has decided to attend the “wrong” ward. It is better to attend a different ward than to cease attending church altogether. But all wards are made up of humans, and all humans are flawed. Eventually we step on one another’s toes. Any hard feelings should be voiced and resolved, not avoided by attending somewhere else. Please provide proof that Joseph Smith did NOT see any angels. Kind of hard to fade away when membership in the church is continuing to grow every year. You will surely see Angelic Thingys with Wingys someday. Where they will take you will depend on your choice in this life to trust in Jesus Christ as your only hope. Without Him, you have none. Brad, the Father, Son and Holy Ghost are one in purpose like I and my wife are one in purpose. Genesis 2: 24 says," 24 Therefore shall a man leave his father and his mother, and shall cleave unto his wife: and they shall be one flesh." Here it says that a man and his wife shall be one flesh, but obviously they are different persons and have different bodies. No, I think the Father, Son and Holy Ghost are separate beings and that the Father and Son have bodies of flesh and bones. That is the correct doctrine. I think there were people at the Nicene council who actually knew the truth, but they were drowned out by the Gnostics, the Arians, the Greek mystics, the pagans, and various other groups with an agenda. Constantine didn't know any doctrine and didn't care about correct doctrine. He just wanted peace in the empire from all the warring factions. We don't need a council to decide doctrine. What we need is a prophet with authority who gets the doctrine from God and who declares it as scripture. The Nicene creed is not scripture. My wife and I are one in purpose in that we partner with God by creating bodies for Gods spirit children so that they can have a mortal existence and learn the good from the bad, and then together we raise them and teach them the way of happiness so that they can return to that loving Father who is the father of us all – a truly divine mission. God said, "39 For behold, this is my work and my glory—to bring to pass the immortality and eternal life of man." Moses 1: 39. The world needs a prophet pronouncing authoritative scripture, not a bunch of uninspired souls having a debate and producing a bunch of nonsense. But what can we conclude if Jesus Christ is God – as in Philippians 2 where he is put forward as "being in very nature God"? Is he only one in purpose with God the Father? Then, as you point out, there are at least two Gods. When I read Isaiah 44:6 “This is what the LORD says— Israel’s King and Redeemer, the LORD Almighty: I am the first and I am the last; apart from me there is no God" I have to conclude that God is eternally one God. The persons of the Trinity are separable as persons, but not as God. You are right, Brad. Jesus was the God of the Old Testament, or Jehovah, and formed this world under the direction and supervision of Elohim, the Father. That is why the Jews killed him, because of blasphemy. In John 8: 58 Jesus says, " 58 Verily, verily, I say unto you, Before Abraham was, I am. 59 Then took they up stones to cast at him:". Saying that he was "I AM" to the Jews was saying he was Jehovah. The Father and Son are so united that dealing with one is the same as dealing with the other. Christ has full authority to speak for God, the Father, or even as God. This principle was also demonstrated by angels delivering messages from God and speaking in the first person as God. There are several examples. When the angel appeared to Hagar in Genesis 16, he delivered his message in the first person. So, Jesus has full authority to act in God's name and whether he is speaking as Jesus or as God, it doesn't matter. My wife and I have the same relationship. In all our financial dealings and other dealings, dealing with her is the same as dealing with me. There is no difference. She often volunteers me for things, which is mildly annoying, but her word is the same as mine. Your statement that they are separate beings, but one God is interesting. I think I could agree with that. @reality– As a converted Mormon, I say to you that you can believe whatever you want to believe, it doesn't matter to me. I have two kids that believe as you do. You cannot any more disprove the existence of God than I can prove the existence. I do think it's interesting that all the non-believers follow the year format with no issue. The year 2011AD is based soley on the death of Jesus. Another point–do you really think humans are intelligent enough to have put themselves here on Earth? Putting the final kibosh on religion to include Mormonism in less than 300 words: Priceless!!! A quick Google, Bing or Yahoo search will put the kibosh on any other groups calling themselves religions. Mormonism will slowly fade from society as will contemporary Christianity and Islam because of the obvious problems with the founders of these religions especially their angelic/satanic hallucinations and related prophecies. "Pretty and ugly wingie/horn blowing thingies" simply do/did not exist. @justsaying–Mormonsim isn't going to fade when church membership continues to climb annually. America suffers a lot calamities,too many to mention and then you more-morons say it is a blessing..from God.....WHAT? This year the Mormon young men are being taught to marry within their own race. It is in the current Aaronic priesthood manual. It says “We recommend that people marry those who are of the same racial background generally". I was wondering where you pulled that statement out of, because I just checked the current Aaronic Priesthood Manual regarding marriage and the Temple and there is absolutely nothing in it regarding race. That would make sense because being brought up in the Church of Jesus Christ of Latter-Day-Saints I have never ever ever and then some ever heard of anything regarding race selection and marriage, and since I have aquaintances, friends, and even family members who have been married in the Temple to those who were not of their own race, I'm wondering what is up with you? Kev, it is in the manual. Read it under "Choosing an Eternal Companion." I gave you the link to the official LDS website for the manual in the last post. If you are wondering what is up with me, read the manual. It is there. It was the words of Spencer W. Kimball. What is up with a church that still teaches this to its young men? Okay, I just went to the site you listed, and it's not it's not an LDS Aaronic Priesthood Manual website. It was just a message board with just a bunch of comments. If you want to go to the actual site to see that manual, you need to go to the following site. The link I gave takes you right to the lesson. Lesson 31 Kev, it is there. Your link works too, just select lesson 31. If you have the hard copy manual, it is on page 128. Kev, are you being completely honest in your dealings with your fellow man? The link I gave was fine. It does not go to a message board with comments, it is an official LDS.org link. Are you trying to deceive others? Are you trying to make people think that my link was to an anti-mormon site? I am simply giving my source from a current official LDS curriculum manual. Yeah that's really laying it down hard "some of those are not an absolute necessity, but preferred". If it was so important not to make sure there was no interracial marriage, it would have been a much greater emphasis than just simply not an absolutely necessity, but preferred. Considerng that in this day in age, let alone back in 1976, that there are greater difficulties in having an interracial marriage and social acceptance. It was in no way saying you cannot marry interracially. If that were the case there would be no interracial couples married in the Temple for time and all eternity. Lets see, first you denied it was there. Then you hinted that my link led to an anti-Mormon site. Now you try to minimize the words. Kev, you concern me. You said: "If it was so important not to make sure there was no interracial marriage", I never said that. I simply pointed out that in the 21st century the LDS young men are still being taught to marry within their own races. And that is exactly what is being taught. Kev, throwing up a cloud of dust can't hide what is in the official curriculum for young men. And it is a sad and disgusting thing that the LDS church teaches this. Grant you, I did have some difficulty trying to find this quote. It would also help if you site more specifically where you got that quote to begin with not to mention that you need to cite the entire quote. I'm afraid your not quite understanding that quote. The point of the quote was not about racial tolerance or intolerance, it was about keeping one's marriage intact. What is a big emphasis in the church is about eternal families; to be married in the Temple for all eternity. There are many challanges in this world that can threaten and erode a marriage; such things that can include financial problems, clashes within ones own background and even in the 21st century there can be the problem of racial backgrounds as well as cultural and social economic backgrounds that can clash and bring challanges to a marriage. The recommendation was given because since the marriage is so important to be kept together that it would be preferable not to add those extra hardships to that marriage. That doesn't mean that interracial marriage is not appropriate. kev, kev, kev. How could I cite more specifically where I got the quote than from the link that led right to the page it was on? Why are you trying to back pedal on saying that the link led to a message board with comments? That was not honest on your part. There was nothing wrong with the link or the source. I understand the quote fine. "We recommend that people marry those who are of the same racial background" speaks for itself. It is a sad and disgusting thing that the LDS church teaches this to its young men in the 21st century. It is difficult to take your explanation seriously because of the dust you have been throwing up to cloud the issue. @Just wondering. Take it or leave it. I was just saying when I tried to link to the site you listed, it was the message board. The point was I was trying to find what you were talking about, because the quote you presented to made no sense to me based on my life and my experiences of being raised in the church. And though there was difficulty for me in finding out the source you were basing the quote from, I do appreciate your help so that I was eventually able to find it. However, upon finding it, it turned out that the quote you presented was certainly not the complete quote. Since I was able to post the complete quote, that quote could now be read in it's full context." Even though you say that I have been throwing up dust to cloud the issue, I wasn't the one who presented the quote that was incomplete. Many people have traditionally believed the Bible says not to inter-marry racially, but upon further examination, it can be realized that it warns against marrying someone with different values. Another thing to consider is that "Mormon" marriages tend to last, with a very low divorce rate. Kev, let it go. You still want to hold to the rest of the quote? OK, let's look at the facts. The young men are being taught to marry within their own race. Young women manuals do not have this quote. Now here is an interesting peer reviewed study. It is accessible online, get the link yourself. Know what it found? It found that white women marrying out of their race had the largest marriage failure rate. Know what the highest chances of a successful marriage are? A White man marrying a Black woman. Those marriages are 44% less likely to divorce than White/White couples. So while you argue about the rest of the quote, hard facts and data from a peer reviewed study show that if the LDS were really concerned about their young men having stable marriages with greatest chance for success and least likelihood of divorce, they would be teaching them in this Aaronic Priesthood manual to marry Black women. Just wondering. Do you know what I've found from various studies regarding interracial divorces rates? Just about a bit of everything meaning that not only there different studies that produce different stats and different rates regarding varios specific types of interracial marriage, i.e. white male/hispanic female, asian male/white female and so on and comparing say between interracial divorce rates internationally as opposed to interracial divorces rates in the U.S. and even the results of the study you gave show that there are allot of variables to be put into the equation, and the results you presented were very limited in that you only cited the results of white man/black woman divorce rate vs white man/white woman divorce rate. The point is there is no one conclusive study that settles the question, so that means that the study you cited didn't really alter the validity of Spencer W. Kimbal's recommendation from 1976 either one way or the other. There other thing is that you may disagree with the soundness of that recommendation, but your conclusion is not based on absolute fact. That it all boils down to being a matter of faith, which is something you build on your own. Well Kev, this study is very recent and addressess the shortcomings of other studies. The results I presented focused specifically on Black and White. And as I pointed out, the greatest risk is white females marrying Black males. But Kimball's quote is not taught to the young women in their manuals. Matters of faith are not the same as statistical data. But how about matters of faith? Why not use words of wisdom from more recent, perhaps living prophets? Kimball is in the past. Many words of past prophets are no longer considered valid. I will maintain that Kimball's statement is disgusting. But there was another LDS prophet whose words are even more so. It was words of Brigham Young, given during a speech in the joint session of legislature on February 5, 1852. It can be found in the LDS archives, Ms d 1234, Box 48, folder 3, located in the LDS Church Historical Department, Salt Lake City, Utah. Brigham Young said that if a white male, a priesthood holder were to marry and have children with a Black woman that he would be better off to have his head cut off and his wife and children killed. He said that if the church were to approve marrying of White males to Black females that the priesthood would be taken from the earth. Now in light of Brigham Young's words, Kimball's words are nothing but disgusting. justwondering, So, let me get this straight. You got your Brigham Young statements based on LDS archives from a joint session of the territorial legislature in 1852 where Brigham Young, who was also serving as governor of the Utah Territory in addition to being the prophet. So now you're veering away from an actual designated church publication from which statements given by the apostles and prophets in it are actually deemed official prophet an apostle statements, that are actually taught in Church meetings to statements given where the prophet is not officially speaking as the prophet. I thought we were still talking about what is actually being taught in the church? I am a white mormon married to a Vietnamese woman. we were married in a Mormon temple. So I am quite certain allegations the LDS church is opposed to interracial marriage are just petty allegations. Are people with Vitilago becoming more righteous as the disease progresses? Micheal Jackson should be a Mormon saint!